The Chad Valley Wood Shed Fire & Police Station is a 4-storey high wooden set affording kids the opportunity to let their creative side flourish as they set off on role play expeditions as police officers or fire-fighters. Watch them race to action! 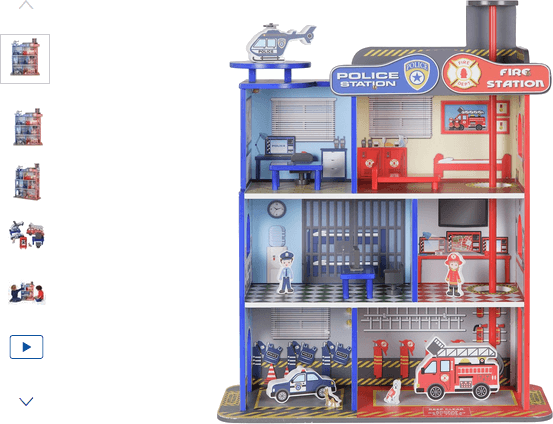 It includes a fireman's pole, fire engine, fireman, police car, policeman, two (2) rescue dogs, helicopter and furniture. Get money off with April 2019 free Argos voucher codes, see if there's a promo code for the Chad Valley Wood Shed Fire & Police Station product. Argos may be out of stock of this product. To enhance your shopping experience you may also be redirected to a search results page when you click an outbound link.